Brett Favre was recently inducted into the Green Bay Packers Hall of Fame and had his number retired in front of a big audience at Lambeau Field. Fans cheered him as he was officially canonized into the team’s long and storied history. The famous Number 4 will now be hanging from the rafters, so to speak. This is an interesting contrast to the last time Favre was here five years ago. At that point, Favre was playing for the Minnesota Vikings and was heavily booed by the crowd at his former home field. It made sense at the time, considering the rivalry between the Packers and the Vikings, but the fact that Favre had been a Packer for so long and had had such a great career there still pointed to him coming back again for a Hall of Fame ceremony. That finally happened on Saturday, July 18th. There was a standing ovation for about five minutes when he finally came out onto the field. In all, 67,000 tickets were sold for the celebration. 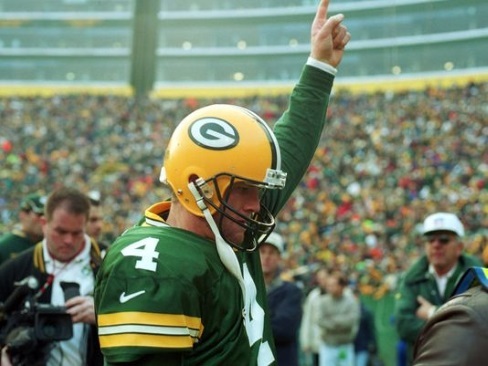 Favre is the reigning record holder in the NFL for all-time passing yards. Seeing someone ever pass that record is hard to imagine. It took Favre 19 years to get to that point, and although Peyton Manning is still active and the next on the list behind Favre, Manning is close to the end of his career. One good season could do it, actually, and that says a lot about Manning as he has missed time due to injury and will still have done it in the same amount of time as Favre. Manning has had several seasons of over 4,000 yards in his career and even a mediocre season this year should bring him that honor. He just needs to stay healthy and log some playing time. In 2013, he had a 5,000 plus passing yards season. But for now, Favre is in the spotlight. He did wonders for the Green Bay organization, and that recognition has finally come full circle. Between 1968 and 1991, the Packers won a total of 1 playoff game. 1992 was Favre’s first season with the team, and between then and now, the team has only had 2 losing seasons. There’s no question that his influence has had a huge influence on these results. And although his exit from the team was less than honorable, Favre has now solidified his spot in the team’s history and all of those bad memories have been overshadowed by the glory he brought to the team. Closure has been reached. As everyone gets ready for the 2015 season, attention will shift off of Favre and into the future. Manning will be under pressure to not only break the record quickly, but to guide the Denver Broncos to the postseason. In 2013,Manning’s best ever season, they went to the Super Bowl to lose to Seattle. In 2014, they went to the postseason again, but exited early after being defeated by his old team: Indianapolis Colts. When it comes down to it, despite being the oldest high profile player in the NFL, Manning is still one of the best players out there. He finished fourth in the QB Rating category last year, and with a new contract under his belt, will be eager to go out in style. What happens in the 2015 season remains to be seen, of course, but it will be exciting to watch it all develop. Regardless of who wins the Super Bowl, watching as Manning approaches Favre’s record will be one of the biggest stories of the year. For this reason alone, he might warrant a spot on fantasy teams.